Bradley or Bradelei upto 1230, Belper became Beaurepeir, meaning pleasant retreat, from about 1230, and is likely to refer to the manor, built in the Coppice area in the 1220s for the first time. The term may originally have referred to only the manor area, not the whole community, but the name took hold and was widely used thereafter. 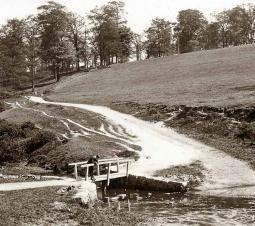 The Belper Park, or Lady Park was one mile in circumference and the smallest in the Frith. The boundary can still be walked today, and features of the park can still be discerned. In about 1230, fish were donated to the pond in Belper Park from Clipstone in Nottinghamshire, a park and lodge belonging to the king. There is evidence that it was about that time when a manor was built here. Around 1270 St John's Chapel (or St Thomas's as it was then) was built for the foresters, although if this was the first chapel on the site it may also have been for the manor. The Belper manor had a larder for storing all the venison caught in the Frith. Salt, probably from Cheshire, was brought here at a cost of four shillings. 1272/3 - A knight's lodge and three garderobe (toilets) were built around this time. The Belper Park was not a hunting park, and may have just been for keeping together deer that were pregnant, or as a deer 'larder'. In 1313/14 3s 6d was paid for spreading hay and holly loppings in the park during the winter. Walks around the Parks take place occasionally, provided by volunteer walk leaders from Strutt's North Mill. Details are available from www.belpernorthmill.org.